HyprMX provides a managed service. To create an account with them, contact them directly at integration@hyprmx.com. Once your account is created, they will help you set up your application and retrieve the required parameters to activate HyprMx in your ironSource account. API Key This is the unique identifier of your account in the HyprMX system. Distributor ID This is the unique Application identifier which HyprMX will deliver ads to. Placement ID This is a unique identifier of your Placement with HyprMX. Once you obtain this information, you must configure HyprMX’s Parameters in your ironSource Account. By adding the above information correctly, you will be able to take full advantage of HyperMX’s ad inventory and reporting data on ironSource’s Mediation platform. Once you obtain the above parameters, log in to your ironSource account and go to ‘Monetize‘ ➣ ‘Mediation‘ ➣ ‘Network Setup‘. 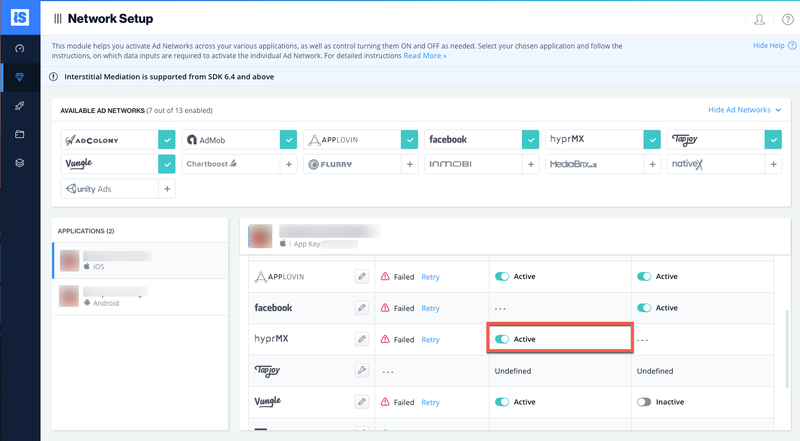 Select HyprMX from the list of available Ad Networks and input the HyprMX ‘API Key‘. 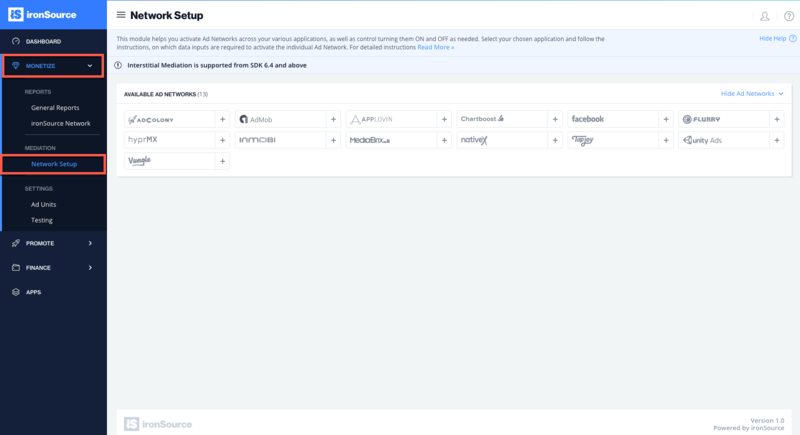 Next, select the app on which you’d like to run ironSource’s Mediation with HyprMX. Go to HyprMX on the Setup dashboard and click the Define icon. Then enter the ‘Distributor ID‘ and ‘Placement ID‘ in the relevant fields and click ‘Save‘. You will then see HyprMX as Active for Mediation on the Setup Dashboard. Add the HyprMX Adapter to your build. You can find the latest HyprMX Adapter here. After you download the Adapter; drop the HyprMXAdapter jar into the libs folder in your Android Project. In Android Studio go to File ➣ New ➣ New Module ➣ Import .JAR. 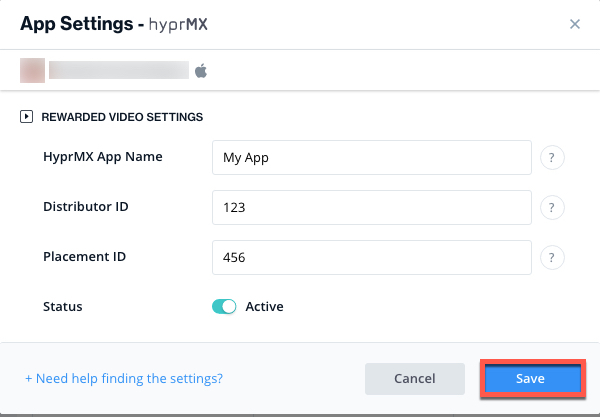 Navigate to the location where the HyperMX SDK has been downloaded. The ironSource SDK provides an easy way to verify that your Rewarded Video Mediation integration was completed successfully. To verify your ironSource and additional Ad Networks integration, follow this document. You are now all set to deliver HyprMX within your application! 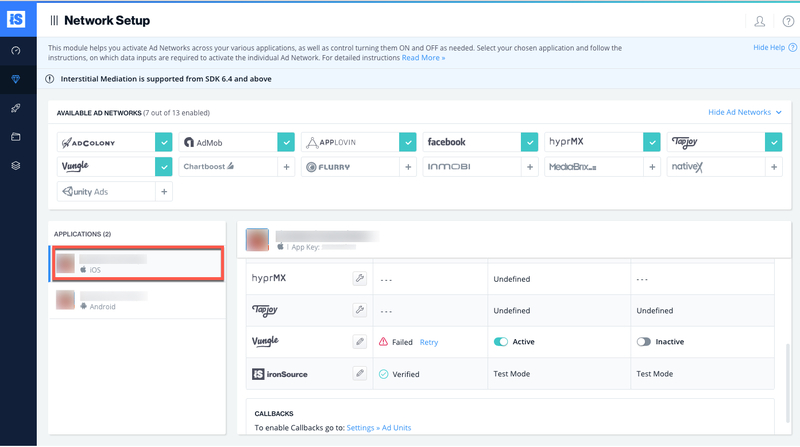 To add additional Rewarded Video Ad networks, follow the integration guides on our Supported Ad Networks list.